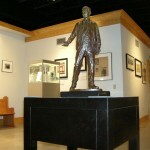 The LBJ Museum of San Marcos offers permanent and special exhibits that can be viewed at the Museum, as well as online exhibits and other educational information. There are many programs that can benefit students and individuals of all ages. We encourage your participation. We challenge you to learn more about our future from our past. The LBJ Museum features exhibits of presidential memorabilia, early photographs, local news clippings, a book collection, LBJ’s college yearbook, campaign artifacts, paintings and renderings, miniature statues of LBJ and much MORE! Here are some online materials that describe President Johnson’s life in San Marcos and Cotulla, as well as a few major speeches, quotes and videos. 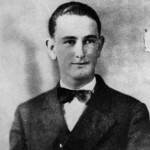 And take a quiz to test your knowledge of LBJ! 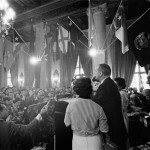 The LBJ Museum’s programs feature collection development, school and group tours, our virtual classroom, traveling trunk, oral history project, guest speakers for your organization, and special lectures. We have great events happening all year long! 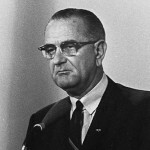 Here is a summary of the archives and manuscripts available at the LBJ Museum of San Marcos. They include news clips, articles, research papers, speeches, legislation, audio-visual materials and Texas State University history.